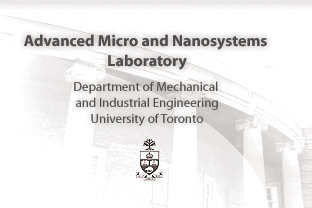 The Advanced Micro and Nanosystems Laboratory (AMNL), founded in 2004, is affiliated with Dept. of Mechanical and Industrial Engineering, Inst. of Biomaterials and Biomedical Engineering, and Dept. of Electrical and Computer Engineering. With a unifying theme centered upon the development and application of novel micro/nano devices and systems, AMNL’s research ranges from fundamental science, to applied biotechnology, to emerging engineering issues. Many of our present research projects involve the manipulation and characterization of biological cells and nanoscaled materials. 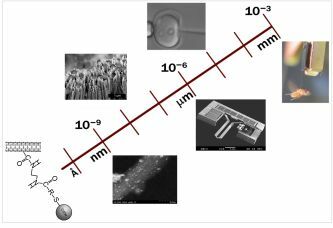 The actively pursued areas are micro-nano device design and fabrication (MEMS sensors and actuators, bioMEMS, and NEMS); microrobotic manipulation of biological cells; microstructure control; cellular mechanobiology; and nanorobotic manipulation of nanomaterials and biomolecules. Micro, nano, and bio are integrative components of our research, in which technological innovations are made in MEMS, nanotechnology, micro-nano-robotics, and biomechanics to better understand basic life sciences problems, facilitate biological/biomedical studies, and enable us to tackle fundamental and applied biomedical/clinical and emerging engineering problems. Taking a multidisciplinary approach in research, our dynamic team consists of researchers from various backgrounds in mechanical engineering, electrical engineering, and biomedical engineering. We work with an exciting network of clinician scientists, biologists, nanomaterial scientists, and many industries inside and outside Canada.